It’s refreshing to see some sounds outside of the usual list of classic kits and snares. In particular, the orchestral and electronic sounds are highlights. Not the best out there for traditional kit sounds. There’s no shortage of sample packs and sound libraries for us to use with our e-kits, and this is largely down to Swedish noise-capturers, Toontrack. The company, which’ll be celebrating its 20th year in 2019 has changed the way drums make it onto recordings, democratising access to kits recorded in some of the world’s greatest studios for what is sometimes a ridiculously low fee. However, while we might all have plenty of great traditional kit sounds to play over MIDI, there’s not always an abundance of much outside of this. The new Action! add-on for EZ Drummer offers something a bit different: cinematic percussion. 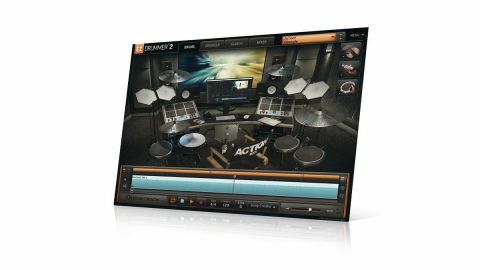 As with all Toontrack EZX expansions, you’ll need a copy of EZ Drummer (£114) to use the Action! pack. Once installed, it gives you access to 450 sounds ranging from orchestral percussion to vintage drum machine sounds and ethereal effects via the 21 included presets. That’s great, but I’m not making James Bond scores,’ we hear you cry. Well, there’s no getting away from the fact that this pack is aimed as much at composers as it is drummers, and if you’re looking for traditional kit sounds, there are far better options. But that’s not to say that Action! is only useful for its intended purpose. The orchestral and electronic sounds stand out as some of the strongest, and the electronics will suit pop tracks as much as anything else. Action! offers nearly 30 sources per-preset, so triggering every sound from your electronic kit will be a challenge (or not possible). It’s not going to be for everyone, but it does what it does well.